This review was written by Keith Olbrantz, who has contributed Irish course reviews to the site in the past. 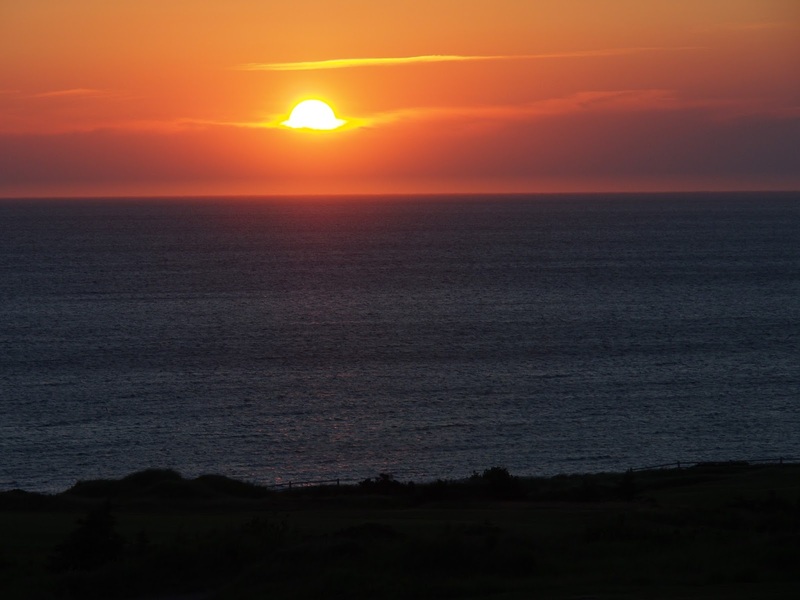 Fortunately for us, he spend a few days up in Nova Scotia and the photos are amazing… To see all of his reviews, click here. 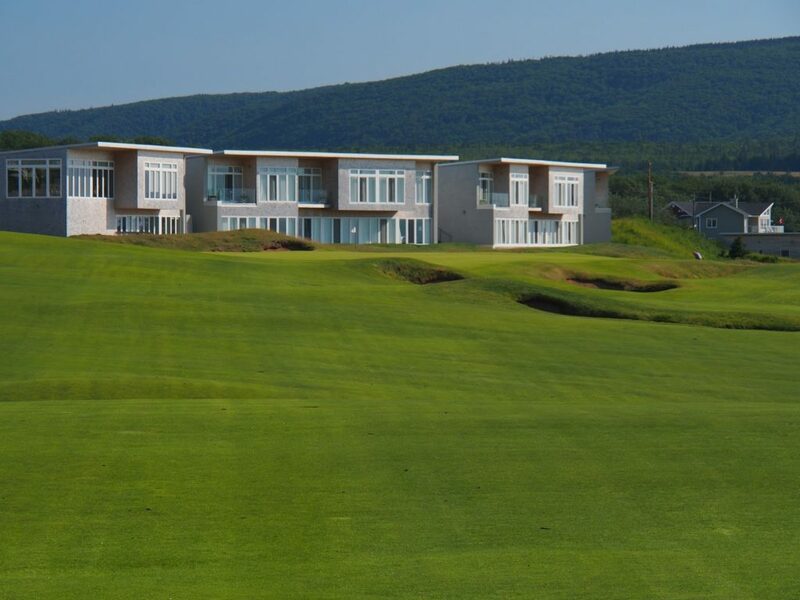 In 2005, Ben Cowan-Dewar entered into an agreement with the town of Inverness on Cape Breton Island to develop a golf course along 160 acres of open space. 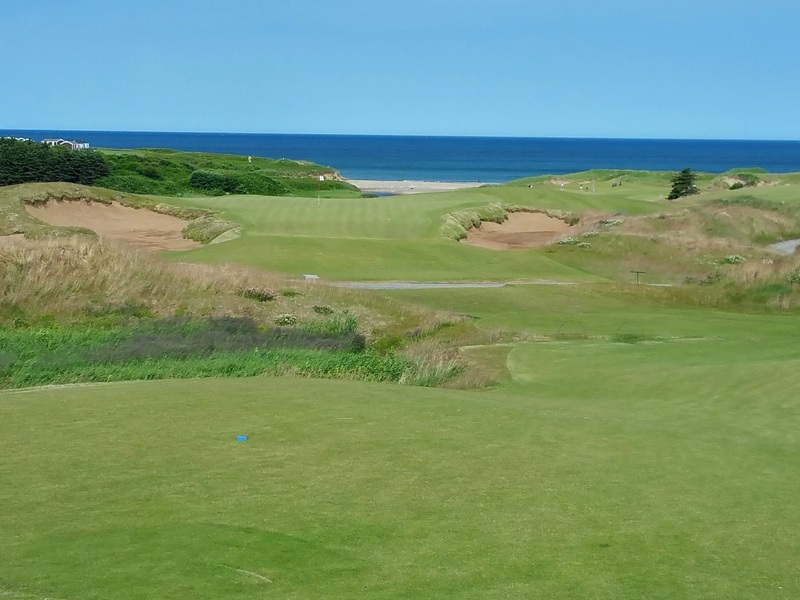 The land was sprawled between the town and the Gulf of St. Lawrence, and he then successfully recruited Mike Keiser, owner of Bandon Dunes as a partner for the project. Mr. Keiser knows a thing or two about developing a links golf resort and the partnership has created a fabulous place for lovers of the game. In July 2016 I had the pleasure of staying four nights at Cabot Links while playing one round on Cabot Links and three at Cabot Cliffs. Unfortunately, a nagging elbow injury kept me from playing a lot more. The golf courses are truly wonderful and the lodging is like heaven for the golf fanatic! 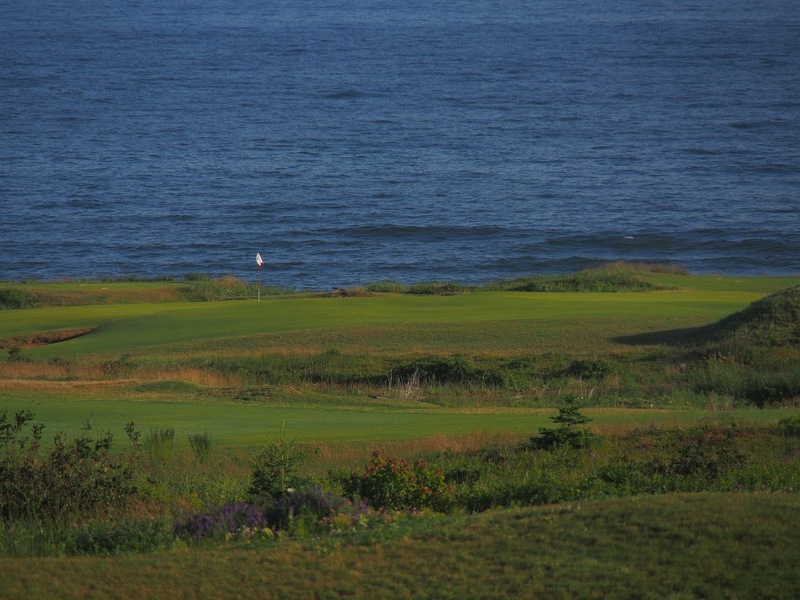 At Cabot Links, the ocean is visible from nearly the entire course with 6 holes right along the ocean. Luxurious rooms right on the course overlook the ocean with Sunsets to die for. Huge picture windows, and even more important for this site, 8.0 PowerShowers with heated bathroom floors! 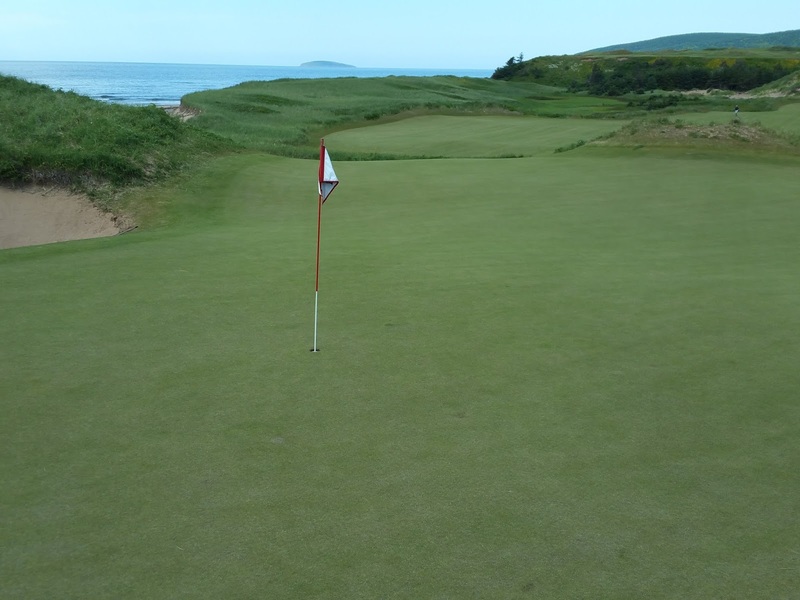 The second course at the Cabot Links resort opened in July 2015. 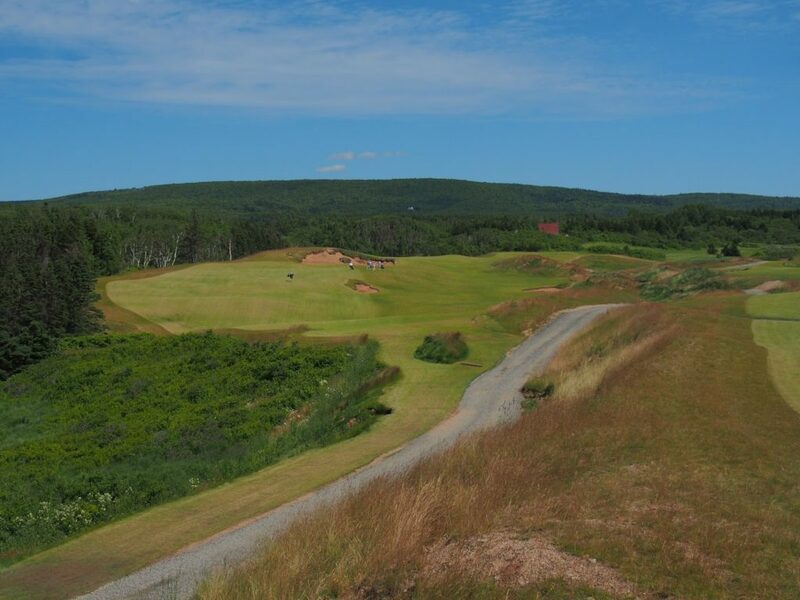 It was called Cabot Cliffs and was designed by the team of Bill Coore and Ben Crenshaw. Since that point, it has rapidly ascended the lists of the World’s top golf courses. The architect team used the unique features of the site to create 18 wonderful and memorable golf holes with the most spectacular finishing stretch I have ever played. Many links courses have a weak opening and closing hole as they are constrained by the need for the clubhouse to be off the best linkland and have road access. Cabot Cliffs does not yet have a clubhouse (just multiple yurts as temporary structures). 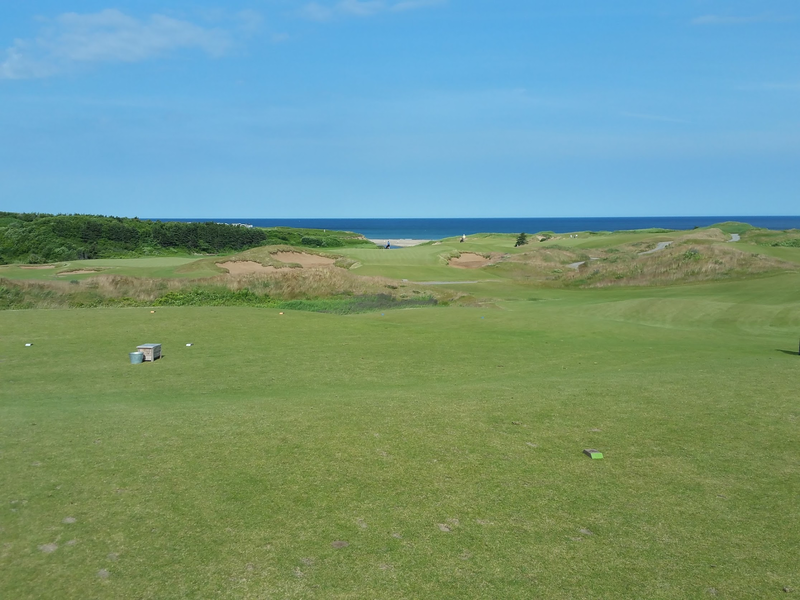 The first hole is a long par 5 and probably should be named “last unspectacular.” There are nice ocean views from the green, but the hole is otherwise not in the same class as the rest of the course. On the other hand, the 18th is a very special finishing hole which we will visit later. 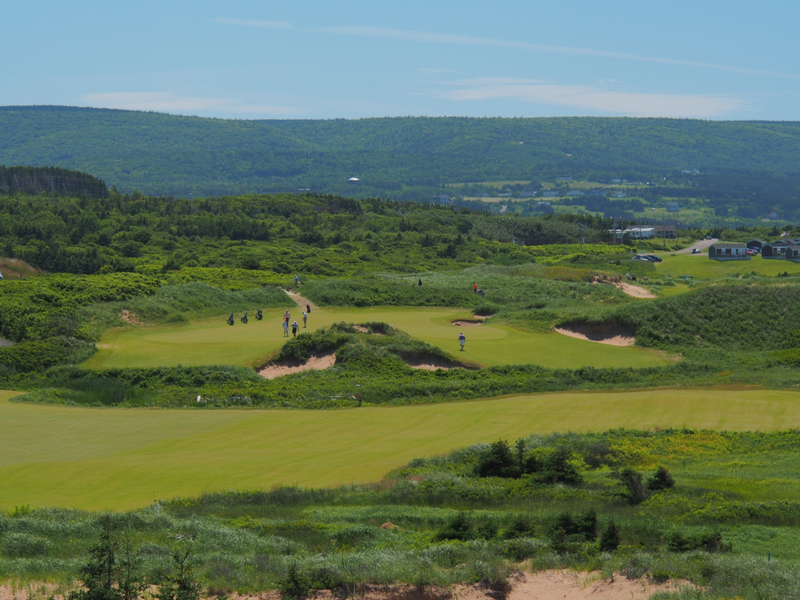 Hole #2 – A spectacular short par 4 with a large central dune in front of the green. A drive left allows the best view of the multi-tiered green. Plenty of birdie potential due to its length, but a price to be paid for an errant shot. Hole #3 – A BIG par 4 with a double fairway. Right of the central bunker gives the best angle into green. Hole #4 – A par 3 with two different greens. The backstory is that Coore and Crenshaw could not agree on the best location, so they built them both. I prefer the shorter (140yds) upper right green location as the beach and ocean make a great backdrop. The hole is well-bunkered with challenging slopes. The longer (212yd) lower left green isn’t bad, but just isn’t as scenic. Hole #5 – A cape style par 4. Long hitters can take on the lake and get close to the green. Otherwise a precise fairway wood or hybrid tee shot leaves a downhill short iron to the green with a kick area front right. Hole #7 – A brute of a par 5 with a forced carry off the tee. 570 yards and a three shotter for us mere mortals. The well guarded green demands good position on your 2nd shot. Hole #8 – A reachable par 5 with a mild Biarritz green. Drive needs to carry a left fairway bunker at 225 from the regular tees and 262 from the back tees. A nice relief after the tough 7th, but apparently not too photogenic. Hole #9 – A wonderful short par 3 requiring good distance control to carry the bunker fronting the green, but not go past the pin as the ball will release to the back of the green and leave a brutal putt. Hole #10 – A three shot par 5 for all but the longest hitters. Distance control on the 2nd shot must be precise to avoid the large ravine in front of the green. Hole #11 – A well-bunkered medium length par 4 playing slightly uphill. Hole #12 – A long par 3 (223, 245) with a green and right sideboard sloping right to left. If you carry the right short bunker, balls hitting the sideboard right of green will feed toward pin. There is a fairly big dropoff from the left side of the green. Par is a great result here. Hole #13 – Another medium length (362, 398) par 4. If you can keep it out of the right bunker and creek off the tee, you are faced with this semi-blind uphill shot. A prominent sideboard on the left allows you to hit left of the green and feed the ball to the hole from there. Lots of left to right slope on the front of this green. 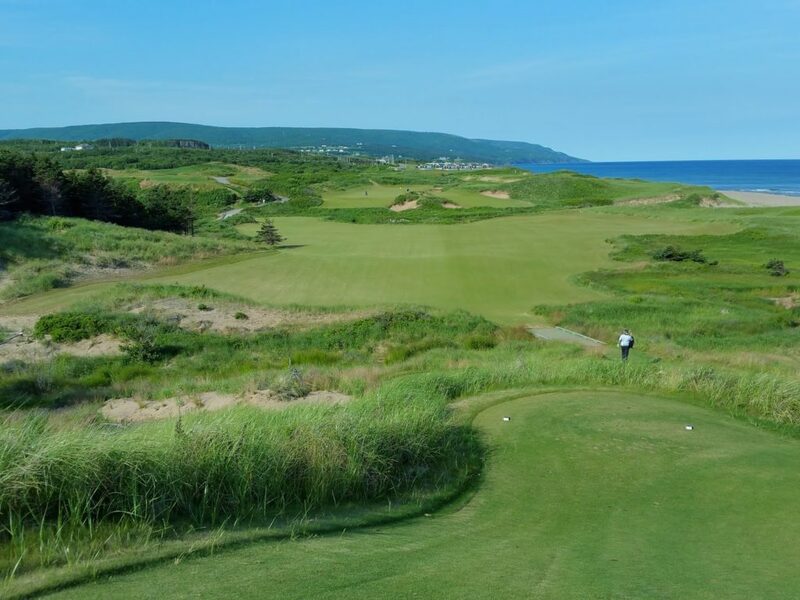 Hole #14 – One of the things I really like about Cabot Cliffs is how Coore and Crenshaw incorporated some of the site’s natural features in the design. The gypsum deposits in this right front bunker complex look fantastic (unless you have to play from near them). The hole is a 172-188-yard uphill par 3 again with a tough green demanding an accurate shot. 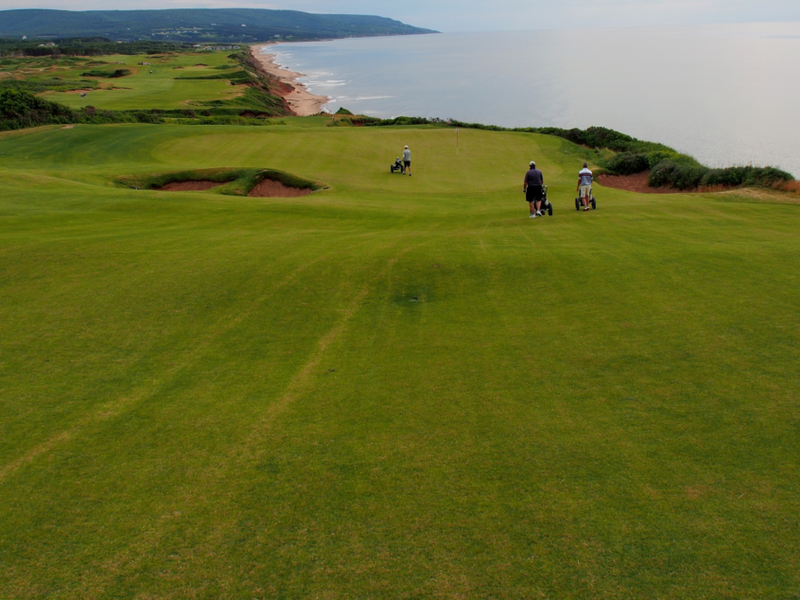 Hole #15 – The 14th was only an appetizer for the spectacular scenery of the closing stretch at Cabot Cliffs. The 15th is a 538-560-yard par 5. The caddies recommend driving left of the center fairway bunker onto the plateau for the best look at the green. Just right of the bunker gives a good look as well. One round I discovered that I can carry to the back lip of the center bunker – not the preferred line ;-). When you crest the hill the expansive view is amazing. It is downhill to the green from there and potentially reachable in 2, but the green slopes front to back so it is hard to hold. The green has a higher tier on the left front adding to the challenge once you get there. Hole #16 – The pace of play grinds to a halt on this breathtaking 150-176-yard par 3. Everybody wants their picture taken! There are certainly worse places to be delayed. In addition to its beauty, this is a challenging par 3. The green is narrow front to back so it is easy to find the back bunker. The two-tiered green is higher on the left. If you bail left on the tee shot you are faced with a very tough putt if the pin is center or right. Hole #17 – A short par 4 that is drivable by the very bold. Most will play a hybrid or fairway wood on the line to the golfer on the right side of the hilltop and then face a downhill 60-80-yard shot from a downhill lie. You don’t get many chances in North America to putt from 80 yards, but putter or bump and run are easily the best choices if the left greenside bunker is not in your line. Hole #18 – A 509-532-yard cliffside par 5. A spectacular finishing hole. Reachable in two for the strong player but a very narrow approach due to the bunker left and ocean right. Lots of trouble right on the tee shot. The preferred drive is 10 yards right of the left fairway bunkers. All of the praise and accolades Cabot Links/Cliffs have received all well deserved. A fantastic place to play links golf. While a 3 hour drive from Halifax airport, it is still relatively easy to get to from the East Coast of the United States. Very highly recommended!